This list is being continually updated. Let’s hope that we’re within the last hours of Harvey taking its last, horrible gasp so that water can drain off and people can start putting their lives back in order. We hope all of our readers are safe and well. Here are the grocery stores and restaurants reported open in the Greater Houston area today. You know something not on this list, please e-mail us so we can share it with the rest of our readers. Please also check the comments below as others share additional information. Bear with us as we continue to expand and add to this. Reports are rolling in by the second. Please do not go out if it is not safe to do so. UPDATE, 8/29/17, 7:30 p.m.: The City of Houston has issued a curfew from 10 p.m. to 5 a.m. Disregard any information about business hours that run later than that. Imposing curfew from 10 pm to 5 am to stop any property crimes against evacuated homes in city limits. We are working on confirming more grocery store openings, but please email us if you have seen some. Sun’s Club, 8388 W Sam Houston Parkway: Reported as open by a reader. Spec’s, 2410 Smith: The downtown superstore was reported open and stocked with Topo Chico by a reader. Fiesta: The company has a list of open stores posted on their website, but do be aware that hours may be shorter than usual. H-E-B: Below is their list of open grocery stores in Houston and the surrounding areas. Please note that most close at 3 p.m today! UPDATE: A reader says the Montrose store definitely closed around 3 p.m. today but may reopen at 9 a.m. on Wednesday. Kroger, 5150 Buffalo Speedway: A reader reports that as of 8:35 a.m. a line had formed. She says she believes she saw a sign about the store not actually opening until 11 a.m., but it may be opening earlier. Walmart, 1111 Yale: Reported by a reader as open around 9:30 a.m. The store was only allowing in 10 people at one time. Whole Foods: The company posted to Facebook that the following stores opened at 11 a.m.: Montrose, Sugar Land, Voss, Kat, Kirby, The Woodlands, Bellaire and Westchase. The Post Oak and Champions stores remain closed. Be aware that stores are subject to being closed early. Keep an eye on their Facebook page for updates. Chick-fil-A: Multiple readers have reported seeing locations open in various parts of town. Christian’s Tailgate: General manager Emiliya Browne reports that the Midtown, Highway 6 and Heights locations are all opening today with a limited menu. Panera Bread: Please see the Facebook post below for open locations across town. Cafe East 3, 6771 South Texas 6: According to a reader, the restaurant owner hopes to be able to be open regular hours today. Dandelion Café, 5404 Bellaire: The popular coffee shop is open from 8 a.m. to 2 p.m. today. It is also accepting donations for the George R. Brown Convention Center shelter. A list of needed items is shown below. Jonathan’s the Rub, 9061 Gaylord: The restaurant and popular BYOB spot is back in business: opens at 6 p.m. today. Black’s Market Table, 11550 Louetta: Rachele Black reports the restaurant will be open from 11 and to 7 p.m. First responders eat free and 10-percent of proceeds will be donated to Northwest Assistance Ministries. Fluff Bake Bar, 314 Gray: The pastry shop is opening and collecting donations for the George R. Brown shelter. Your Pie, 1625 Main: Still open and serving as of 2:51 p.m.
Adair Kitchen, 5161 San Felipe: Chef Joseph Stayshich says, safety permitting, the restaurant will be open today. We are not sure what time, but it normally opens at 7 a.m.
Amalfi Ristorante Italiano, 6100 Westheimer: A representative from the restaurant e-mailed to say that it is open from 11 a.m. to 10 p.m. for lunch and dinner. Beaver’s West, A representative says that Beaver’s Westheimer will open today for dinner beginning at 3 p.m. and be open for regular hours beginning tomorrow. Fire, police and first responders eat free. The restaurant will donate $2 from the proceeds of select cocktails and 50-percent of all merchandise sales to the recovery effort. The Brisket House, 5775 Woodway: Reportedly opened at 2 p.m.
Caracol, 2200 Post Oak: Owner Tracy Vaught says it will open with a limited menu. She was not sure what time as of last night, but it normally opens at 11 a.m. Update: Confirmed open and also accepting donations for flood victims. Monetary donations will go to the mayor’s donation fund and Houston Food Bank; prepared food and clothing will be taken to area centers and hospitals. Dish Society, 5740 San Felipe St #100: Update: has closed but will reopen tomorrow. According to owner Aaron Lyons, the original Dish Society location will open for lunch and remain so until it runs out of food. First responders eat for free. Kolache Shoppe, 3945 Richmond: Update—Sold out. Per a representative, will be open this morning until sold out. Grotto, 4715 Westheimer: Reported as open by a reader. Willie G’s, 1605 Post Oak: Reported as open by a reader. Cottonwood, 3422 North Shepherd: The Garden Oaks hangout opens at 4 p.m. with a limited menu. Field & Tides, 705 East 11th: The restaurant opened for lunch and a representative said it would stay open as long as it could. Hours may be abbreviated. Jus’ Mac, 2617 Yale: The restaurant posted their opening announcement to Facebook. Porch Swing Pub, 69 Heights Boulevard: General manager Brooke Gordon says the pub is open from 3 to 10 p.m.
Rice Box, 300 West 20th: Owner John Peterson reports that it is open abbreviated hours today from 11 a.m. to 6 p.m. Ritual, 602 Studewood: Assistant manager Kelli McCartney reported that the Heights restaurant is opening with cold drinks and a limited menu of hot food. It normally opens at 11 a.m.
Sonoma Heights, 801 Studewood: Open at least for lunch today per owner Farrah Cauley. Think Tacos food truck, 1433 North Shepherd: Open at Heights Biergarden as of 8 a.m.
Babin’s Seafood House, 21851 Katy Freeway, Katy: Marketing manager Heather Roy Hayes reports both the Katy and Woodlands locations open at 11 a.m. 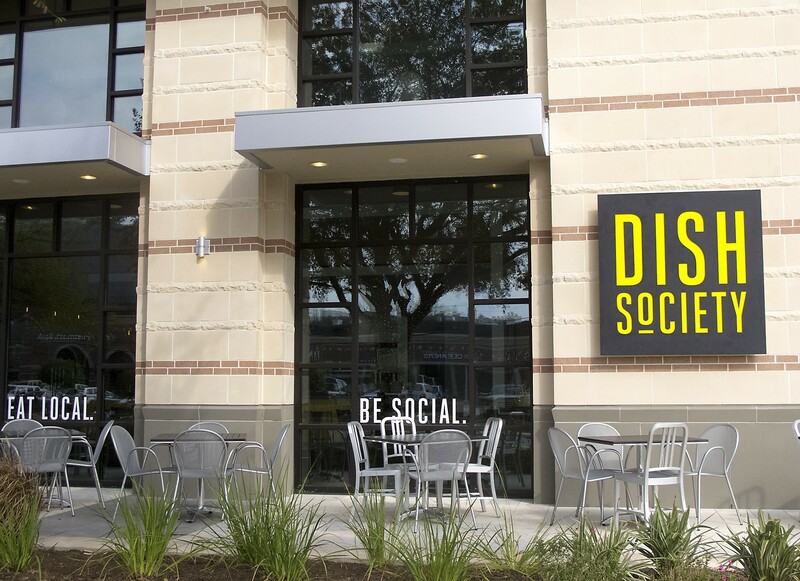 Dish Society, 23501 Cinco Ranch: Update: Has closed but will reopen tomorrow. Owner Aaron Lyons says both locations—including this one in Katy—will run with a limited menu and staff for lunch until they run out of food. First responders eat for free. Third Coast, 6550 Bertner Avenue: The sixth-floor restaurant is ready to serve customers until 10 pm. It is located in the John P. McGovern Campus on the sixth floor. Roostar Vietnamese Grill, 1411 Gessner: Owner Ronnie Nguyen confirmed it will be open today, but we don’t have confirmed hours yet. Mesquite Cottage, 1570 S Dairy Ashford: After it opens today (we believe at 10:30 a.m.), first responders and reporters will get a sandwich and drink for free while the general public will receive a 20-percent discount. The Burger Joint, 2703 Montrose: The plan is to open according to co-owner Matthew Pak. Bollo Woodfired Pizza, 2202 West Alabama: According to owner Ray Salti, the restaurant is opening at 4 p.m.
Cuchara, 214 Fairview: Open today with a limited staff per owner Ana Beaven. Hugo’s, 1600 Westheimer: Owner Tracy Vaught says it will open with a limited menu. She was not sure what time as of last night, but it normally opens at 11 a.m. Update: Confirmed open and accepting donations, too. Monetary donations will go to the mayor’s donation fund and Houston Food Bank; prepared food and clothing will be taken to area centers and hospitals. Jenni’s Noodle House, 3111 South Shepherd: Owner Scott Tranweaver says it will be open if the roads are clear. La Grange, 2517 Ralph: The expansive Montrose bar and eatery opens at 4 p.m. with a limited menu. It is supposed to be open until midnight. Mercantile Montrose, 3321 Stanford: Report open until 4 p.m. by a reader. Pepperoni’s, 2710 Montrose: Owner Ray Salti says this location of the local pizza chain opens at 4 p.m.
Ramen Tatsu-ya, 1722 California: The Montrose ramen shop is expected to open with a limited menu from 1 to 8 p.m., as long as weather conditions are favorable. Riel, 1927 Fairview: Chef Ryan Lachaine plans to open at 5 p.m.
Siphon Coffee, 701 West Alabama: Open until 6 p.m.
Chuy’s, 19827 Northwest Freeway: A reader reports this as open with a limited menu. Apparently, they have margaritas, too. Backstreet Cafe, 1103 Shepherd: Beverage director Sean Beck says it is open and accepting donations for Hurricane Harvey victims. Monetary donations will go to the mayor’s donation fund and Houston Food Bank; prepared food and clothing will be taken to area centers and hospitals. La Griglia, 2002 W Gray: Reported as open by a reader. Eloise Nichols, 2400 Mid Lane: Chef Joseph Stayshich says, safety permitting, the restaurant will be open today. We are not sure what time, but it normally opens at 7 a.m. The Branch, 7710 Long Point: Amanda Pierson says it is opening at noon with a limited menu. Rajun Cajun, 4302 Richmond and 9600 Gessner: Both locations are open until 8 p.m.
Roegels Barbecue, 2223 South Voss: Update: sold out and is redirecting customers to The Brisket House at 5775 Woodway. Owner Russell Roegels plans to open his popular barbecue joint today at 11 a.m.
Bedibas, 2606 Edloe: Open today per executive chef Joseph Stayshich of Adair Restaurant Group. Café Rabalais, 2442 Times: Chef Michael Nutt says the longstanding French restaurant will open for dinner service with a limited menu. El Meson, 2425 West University: Hours may be shorter than usual, but it has opened today. Helen Greek Food & Wine, 2429 Rice: This opened at 5 p.m. and is primarily operating as a wine bar, with “wine, beer and a limited menu of dips, gyros, salads and maybe a few other items with a very limited staff.” The bar is also accepting donations of toiletries, bottled water, individually packaged foods, and pillows for hurricane victims at the George R. Brown Convention Center shelter. Phaedra-FYI we are opening the Rice Village location as more of a wine bar tonight and to take donations. We’ll be serving wine, beer, and a limited menu of dips, gyros, salads, and maybe a few other items with a very limited staff. Open at 5 PM until 10 or so, maybe earlier if everyone clears out. Sud Italia, 2347 University: Owner Shanon Scott reports it will be open from noon until 8 p.m. with a limited dinner menu. W Grill Margaritas To-Go, 4825 Washington: Open until 8 p.m.
Babin’s Seafood House, 19529 I-45, Shenandoah: UPDATED—Restaurant has closed for the day, saying it’s too hard for customers to access right now. Marketing manager Heather Roy Hayes reports both the Katy and Woodlands locations open at 11 a.m. Please repost this comment to our Wednesday list. Just published. Thank you!! Just wanted you to know that we at Ambassador Chinese Restaurant on 4326 Richmond are open and are taking customers.